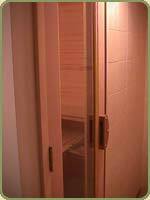 I received the door Friday night and installed it Saturday. We have used it three times now and it is fantastic. Better than I ever thought it would be. 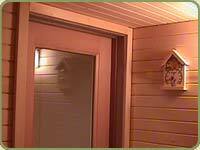 This is the best I could do for a photograph of the new sauna. 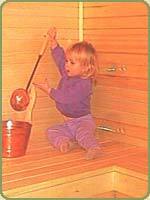 Some of these pictures make the wood look like red cedar. It is nothing like that. (The photo with my daughter is the closest to real life.) 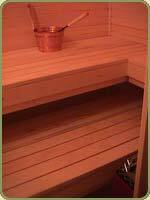 The yellow cedar gives the sauna a light finish, not dingy, it's great! Thank you again for all your help, I couldn't have done it without you.